Hasn’t been a lot happening, lately. I’ve been busy with non-hobby items, like WORK :-D.
I DID work Burkina Faso, XT2AW, on 60-meter FT8. I was just tuning around, seeing what was going on, and saw his CQ. I jumped on him, and the rest is history! I’ve been adding to my Parks on the Air totals … I’m up to 50 parks worked now, and I spent some time this past week tuning up some antennas for my first activation in the near future. I didn’t dive into the CQ WW WPX SSB this weekend, but I hadn’t planned to either. HOWEVER … I did pursue contacts for Parks on the Air. I was rather surprised by how many POTA activators were doing their thing during a major contest weekend, but there were lots. I managed to work around ten parks. Some of them were booming in, some were weak, some were down in the noise and really depended on catching them when the QSB brought them up to the workable level. Of course, some were spotted that I couldn’t even tell were there. I’ve had very little luck on any band other than 40 meters. Sometimes it goes long, but most of the time it’s the eastern half of the US that I”m hearing. Most of my contacts have been SSB, but only a few were CW. That’s because most of the activators seem to prefer SSB. I ordered an American Morse Equipment Porta Paddle II and base last week, and USPS tracking says it’s out for delivery. Great … I’ll have an evening project today. I’ve been looking for a portable key and I think this will fit the bill! I’ll let you know later. The temperature was up in the 70’s this weekend and just beautiful outside. Today (Monday) and tomorrow, the high is supposed to be near 50. Warming up again on Wednesday! C’mon Spring!!! 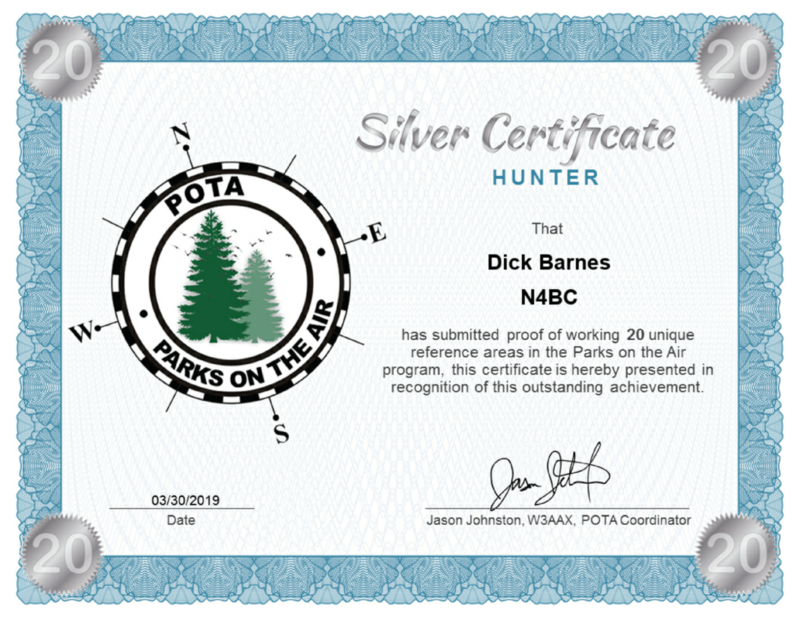 Author dickPosted on April 1, 2019 April 1, 2019 Categories Equipment, POTA, Propagation, WeatherLeave a comment on What’s Up? Saturday I got up early and tried some 20 meter FT8 … man, I couldn’t BUY a QSO. There were lots of stations calling CQ, and some neat ones, too … Africans and Indonesians … and at decent signal strength, too. No dice! I gave up and read a book! I’ve had a pretty good Sunday afternoon chasing Parks on the Air contacts … today I contacted eight ten parks, some CW and some SSB. Four of the parks were with Sean, KX9X, who was running around Connecticut and activating State Parks. Others were in Pennsylvania, Kansas, and Texas. Most were not easy contacts … the QSB and noise has been BRUTAL today, with signals dropping from 59 (599) down to unreadable … or should I say undetectable! BUT … it’s been fun and challenging! I should have been outside today. It was a beautiful day here today, with temperatures in the high 60’s F, and sunny. I really need to get a head start on yard work this spring. Tomorrow it’s back to work … the GRIND … and no time to play radio during the day. It’s that time of year where the temperatures can be up in the 70’s one day and down in the 40’s the next. And POLLEN! I woke up this morning and couldn’t open my eyes. Hate allergies!